Namaste. Yogi Founder of Aquanimous Yoga & Boutique Partners with FEED for Tree Planting | FEED, Inc. Moreover, a portion of the proceeds will go to La Union Soul (also a FEED Partner) for the protection of Philippine shorelines, the 5th longest coastline in the world, which is also a pawikan nesting area. This is Aquanimous’ sustainable “Ridge to Reef” effort to help conserve & protect Mother Nature. Naturally, we accepted off the mat! Thank you Lalah for thinking of FEED; for sharing and expanding the awareness and equanimity we experience during your yoga sessions and around you, towards the environment. Namaste. “Eversince I started surfing in 2002, I wanted to live by the beach but didn’t know how I could sustain it. It took a while until in 2010, when I started teaching yoga, did it occur to me that I can combine both of my passions in SUP Yoga. It became my dream until in 2016, when I finally got the boards, did I decide to move to La Union and start Aquanimous Yoga. Here I met and became good friends with Tina Antonio (FEED Ambassador). 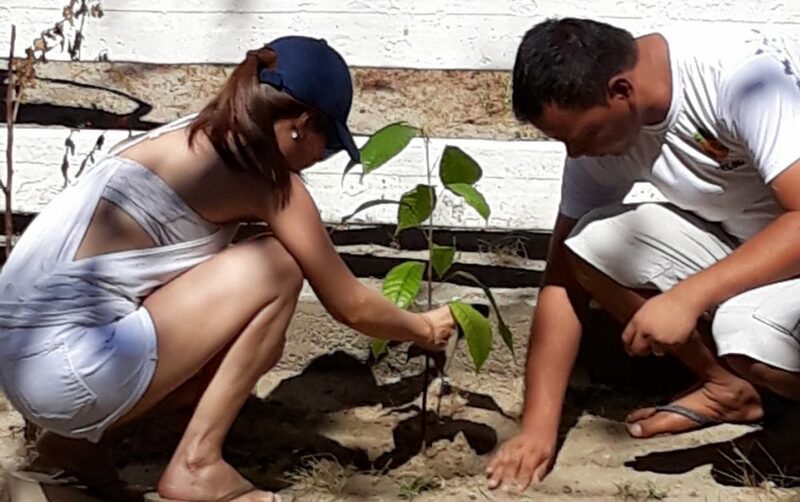 Aside from being the owner of Urbiz Garden Plage, she is also the founder of La Union Soul – a local beach community movement that works together in protecting the coastline of La Union, which is also a nesting site for the pawikan. She is also the one who introduced me to Anne Bakker of FEED. Upon learning that FEED supports sustainable education and tree planting, I told Tina that I will give a portion of the proceeds from my boutique to La Union Soul, and vowed to plant 10 trees for every item sold. This is my sustainable ridge to reef effort to help conserve & protect Mother Nature. And to be able to give back to this wonderful community who has welcomed me so warmly, I am also offering Community Classes every week. The ebb and flow of my yoga journey has never been easy, but it has taught me that yoga, such is life, is not about attainment; rather it is an unending process of self-love, self-discovery, self-acceptance, and self-transformation. At the level of action, these translate into various expressions of effortless service to others and to all beings. As a yogi and surfer drawn by the transformative light of yoga and the vast wonders of the sea, Lalah gave birth to Aquanimous Yoga. In her classes, she intelligently and creatively weaves yoga and meditation principles with her Sports Science and CSCS knowledge to create a unique and well-rounded yoga experience that not only builds a solid core foundation but also promotes balance and ease in the mind and body. She encourages her students to play with their edges and ride them with a gentle, flowing breath. She believes that surrender in the asanas is not just loss of control but also gaining control for the yogi has become one with the breath and now knows how to flow serenely and powerfully at the same time. The insights she has gained about herself through yoga and meditation have been transformational. With each practice, with each passing year, with every new student and life event, she gains a deeper understanding of life’s essence. The ebb and flow of this journey has never been easy, but it has taught her that yoga, such is life, is not about attainment; rather it is an unending process of self-discovery, self-acceptance, and self-transformation. These are what she strives to impart in her classes today. Check out some of the indigenous, Inabel weave towels at Aquanimous Boutique!